I’ve been lagging on this, but I went on a cruise last month. I was kind of lazy to post pictures, but here’s a few for your enjoying pleasure. If you’re my friend on Myspace, then you can view more. We flew down to San Diego where the cruise was leaving from. We got there early and had some time to kill, so my friend Rachel suggested that we go to a place called Hash House a go go and have breakfast. 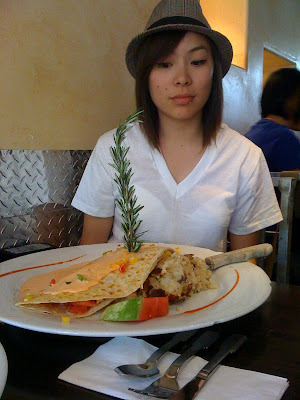 She warned me that the portions were huge and called them “stacks on crack!” Haha And was she right! This picture is taken from Karl’s iphone…and it’s not photoshopped or anything! The portions are just plain HUGE! These were our waiters, Iwayan and Jerry. They’re pretty dope and Jerry told us about his family. He’s from the Philippines and he has about 4 kids I believe. If you think about it, it’s kind of sad. These workers are on the ship, away from their homes and family for about 6 months straight. Jerry talked to us about hoping to retire once his two youngest kids graduate from college so he can go back to Manila. I hope he does so he can enjoy spending some time with his kids. On the way to Cabo…We ended up taking a little tour and got dropped off at Lover’s Beach (around the corner is Divorce Beach). We tried snorkeling out there, but the waves were kind of strong so we didn’t want to go too far out. Did I mention there’s a Hooters there? Our little friends were waiting for us. That’s pretty much it. A lot of memories and fun times.